Misfortune often happens to me. Some friends joke that I have a very unlucky and annoying gene within me. That’s why sometimes I am so wretched about it. I react to my environment unpleasantly accordingly. Oh well…what should I say? I never mean to be bad, impolite or rude. I never mean to make others difficult because of me. I never mean to be too proud. I never mean to upset others because of my behavior. But mistakes happen. This time, no human feeling interfered. One evening, after having a nice little chick snack with other three girls, we were all stuck in the KFC, a newly opened fast-food in Cambodia, located on the Monivong Boulevard. one of the girls managed to get away from the flooded Phnom Penh centre part. What a shame! What a shame my city should have! Every area around me was being flooded. Some place was flooded to a person’s ankle…no no…as I remember, it’s more than that. Some place was flooded to the level of one’s knee. This was a calamity happening not only to me but other hundreds of Phnom Penhers. 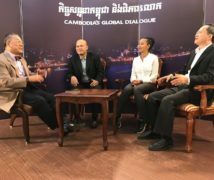 Whose fault was it to have Phnom Penh flooded? Stopping around the big market, we tried to find a side road that had not been flooded. Absolutely not, we could not find one that we wanted. We needed to drive through disgusting and smelly water coming from nowhere (we knew what’s in the water shhhh)…I was breathless driving and driving non-stop as the way of water did not end. By the time I reached my friend’s house to rest, I was breathless, exhausted…well, an inch breath to death. I could say this. The sewage system is still a very big problem for local residents in Phnom Penh these days. No government officials (municipal officials) seem to care about these. Every time it rains, you can release some fish into the river in front of your house in Phnom Penh. Every time it rains, you feel very sick or ailing. That large amount of water does only block the traffic but also the businesses. It slows down everything that is moving. It, in other words, can destroy the economics of the city if no responsible person cares to build firm and strong sewerage. Why don’t they build very good sewerage so that water or rain can flow away quickly? So that you can travel quickly? So that you are healthy, no smelly, dirty water??? It is very easy to ignore what is happening. It is very easy because we can get away quickly. But its effect will be long-term. The responsible people need to take a firm stand to this. It’s very easy for cars to go past water which will splash on other bikes or bicycles. But remember, the water can next time flow in and drown the cars! Sewage systems were built during the eraly 50’s to accommodate a handful of its population [leass then a few hundered thousdan people] in Phnom Penh but now its population has since been out of control. It has been neglected during the war in 1970 then the KR [actually no maintenance works were carried out], on top of that the areas of sweage systems are being recliamed by land fill for the construction of new houses which also contribute to the flood each time shall there down-pour of heavy rain.